"Who's gonna play your music, if you don't play it yourself?" asked Michael Jones, using a music metaphor to capture the essence of community leadership. 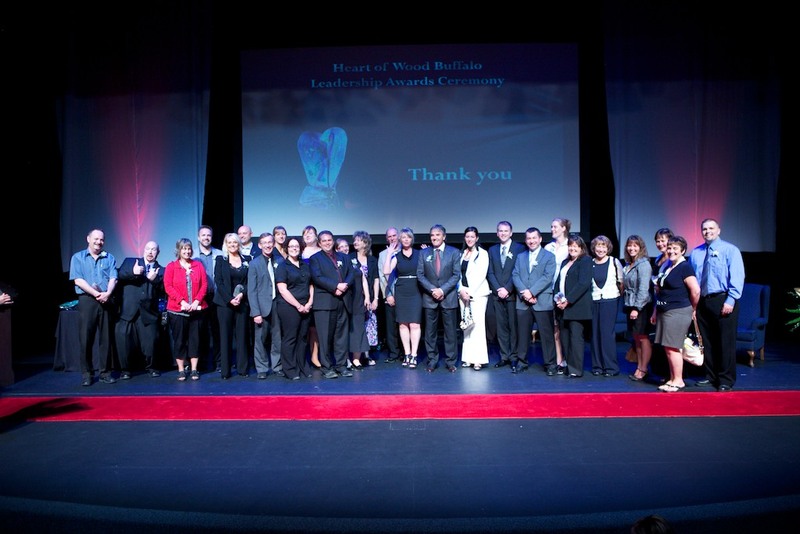 A total of 28 nominees gathered in Keyano Theatre along with their nominators, friends and family for the first annual Heart of Wood Buffalo Leadership Awards, a part of the Wood Buffalo Community Building Project. 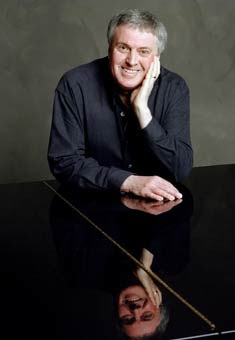 Pianist and leadership consultant Michael Jones weaved a keynote presentation that brought words together with music in a completely unique way. He shared his story of discovering his musical voice, his unique sound, his place in the world, and then sat down at the ivories to create two different pianoscapes. It was beautiful, reflective, deeply impactful. "I was in this small club and found this upright piano off in the corner and began playing," he shared. "After awhile, a young man came and sat on the bench while I played. Eventually he became really quite serious and suggested rather forcefully that I should find my own sound, that I was playing just like Michael Jones." It was a crystallizing moment for him, as he continued to play, trying to figure out how to tell this guy that he actually was Michael Jones. The list of individuals and organizations nominated for the four awards - Philanthropy Leadership, Nonprofit Organization Leadership, Nonprofit Board Leadership, and Nonprofit Staff Leadership - was nothing short of impressive. Emcee Claude Giroux announced the names of the various winners and then sat down with them in a living room setting on stage left and engaged in a delightful dialogue that also revealed to which nonprofit their $5,000 award would be going. 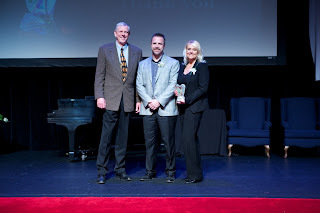 Marty and Dennine Giles from the Northstar Group (Ford) were the winners of the Philanthropy Award, in a tough field that included some strong nominees like Cr. Mike Allen and Cr. Dave Kirschner and his wife Iris. The group of seven also included a media maven (Andryia Browne - Mac Media), retail store owner (Frank Saraka - Canadian Tire), and several contractors (Shawn Chaulk - Stratford Contracting and John Wilson - H. Wilson Industries). 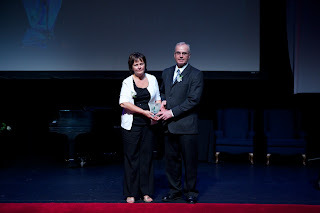 Both visibly touched at being singled out among this prestigious group, Marty and Dennine reflected on leadership and announced their intention to give their cash award to the Family Crisis Society. 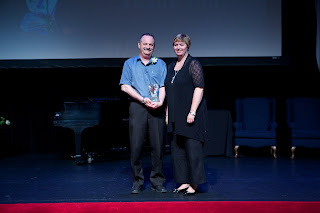 The Wood Buffalo Housing and Development Corporation won the Organization Leadership Award and also shared that their winnings would go to help build a new Unity House (Family Crisis Society). 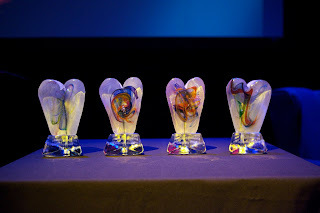 They were selected from a group that included Events Wood Buffalo, Fort McMurray Association for Community Living, Victim Services, The HUB, Primary Care Network, and Volunteer Wood Buffalo. 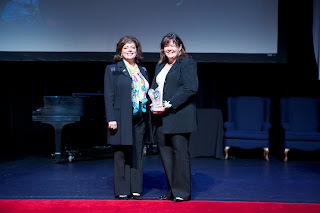 For her formative and passionate leadership of The HUB Family Resource Centre, Christine Burton was announced as the recipient of the Nonprofit Board Leadership Award. Along with several of the other winners, she was asked to share the last three things she does before going to bed. I can't remember what the first two things were, but her final thing was "crawling into bed with the wonderful man who has stood by her all these years as she did her stuff." "He's a hottie, isn't he," asked Claude. "Yes, no question," she replied. "I feel the absolute same way." The audience laughed, and Claude blushed. Christine was in another strong group of nominees that included Greg Butters - Events Wood Buffalo, Kathy Flett - Fort McMurray Food Bank, Steve Kelly - Volunteer Wood Buffalo, Curtis J. Phillips - Huskies Booster Club, Dale Unruh - Keyano College Foundation, and Michelle Velez - Fort McMurray Victim Services. She announced that her $5,000 award would go back into the organization she has served since its inception. 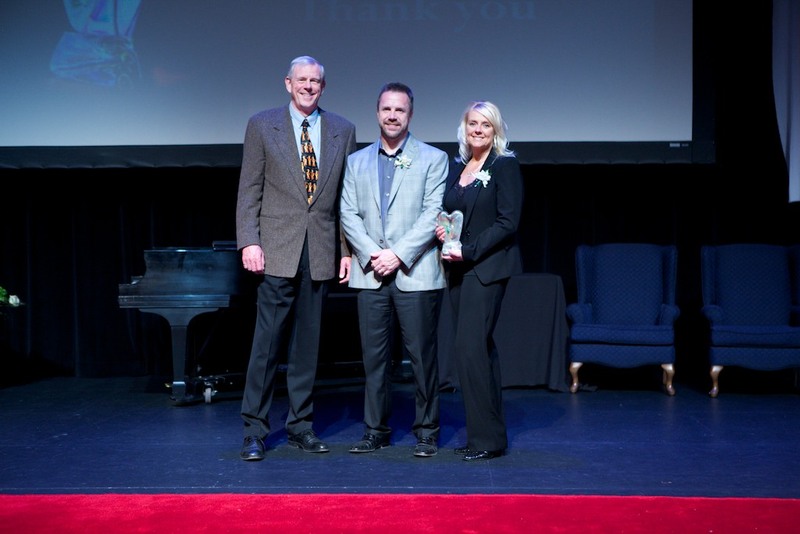 "I love sports metaphors," said Claude, as he introduced the Nonprofit Staff Leadership Award. "And this metaphor comes from a terrible movie called THE REPLACEMENTS with Keanu Reeves. At the point where the game was on the line, the coach asked Who wants the ball?" "The people in this category always want the ball, and they're the ones who take it all the way to the end zone." The winner, Laura Barnes from Victim Services, was brought into the living room for a quick chat. "Tell me a little bit about Victim Services," asked Claude. "We're the people who arrive on your door late at night with the police to share news that you don't want to hear." It was sobering moment, a reminder that many nonprofit leadership roles are often filled by unsung heroes, people who deeply affect lives, one at a time. 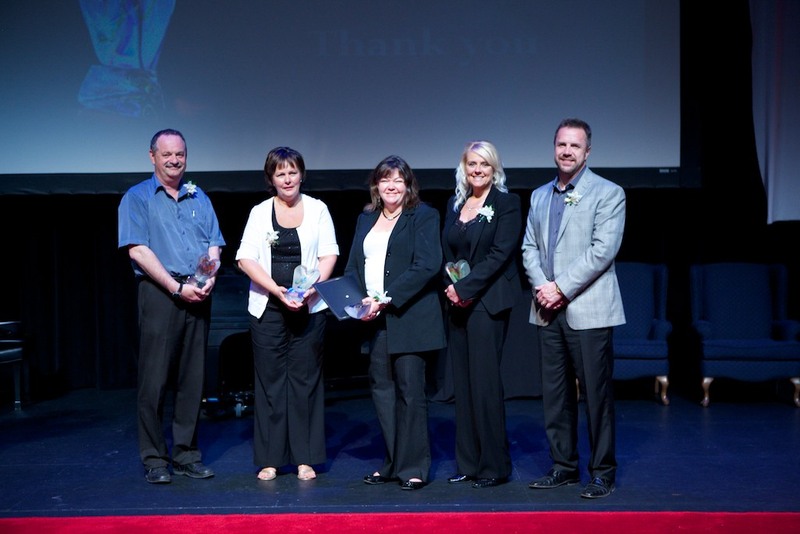 Laura was joined by nominees Cathy Baker-Morrell - Big Brothers Big Sisters, Melane LeBlanc - Keyano College Foundation, Trudy Malone - Soup Kitchen, Gayle Phillips - Fort McMurray Boys & Girls Club, Elaine Reed - Safe Community Wood Buffalo, and Tracey Robertson - Children First. Laura announced that her $5,000 award would be going to Fort McMurray Search and Rescue. "Transformational leadership is about finding your voice," said keynote presenter Michael Jones. 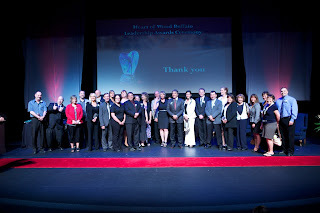 These 28 nominees, individuals and organizations alike, have found theirs and are making beautiful music in our region; they are the Heart of Wood Buffalo. Great story, wish I was there. Wanted to see Claude blush!